At times, our eyes are very sensitive to disruptive influences of the environment. Dry, dusty or smoky room air, intensive solar inradiation or pathogens like bacteria or viruses can be the cause of inflammatory processes at the eyelids or at the conjunctiva. Regardless of what triggers the inflammation, the affected tissue almost always reacts with the same symptoms. The affected area is reddening and also starts to swell. The defense mechanisms taking place in our body cause a boost of the metabolism which leads to warming of the sick mucosa. In addition, the release of certain messenger substances can cause pain. Willow bark contains an active agent whose anti-inflammatory effects have been known to medicine for more than a hundred years: Salicylic acid. It effectively alleviates inflammatory processes as it interrupts the formation of the body’s own messenger substances which are responsible for triggering and the continuation of the inflammation. In the same manner, the emergence of certain pain substances will be prevented. The patients will notice a soothing alleviation of their afflictions. The anti-inflammatory and analgesic effect of this natural substance is ideally complemented by its slight antibiotic effect. Thus, local treatment with salicylic acid protects the patient effectively against unwanted additional infections caused by bacteria or fungi. During the application of salicylic acid in form of eye drops, the anti-inflammatory effect is limited to the location where the disease occurs. Due to its chemical structure and the physical characteristics associated with it, salicylic acid will practically not be absorbed into the bloodstream. Therefore, it cannot trigger any unwanted side effects in the organism. URSAPHARM provides the affected with the anti-inflammatory effect of salicylic acid in form of eye drops. 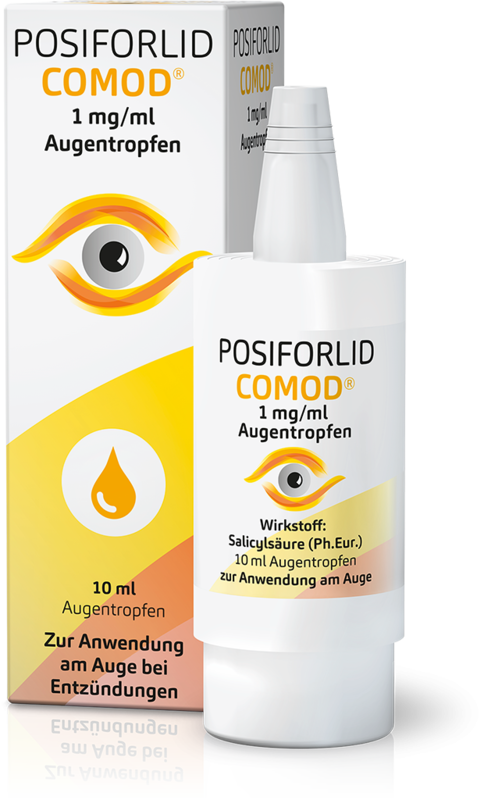 The eye drops allow for a continuous treatment of blepharitis and conjunctivitis during the day.